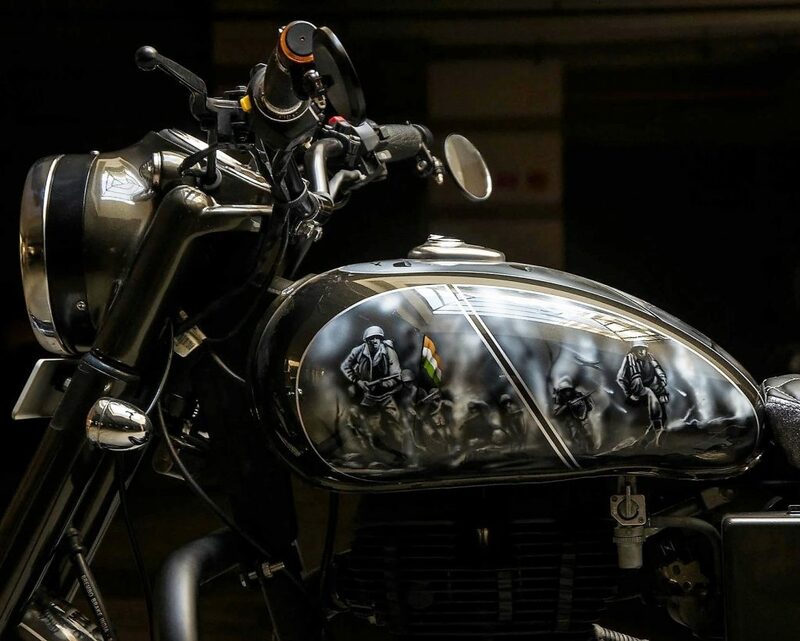 Royal Enfield Classic Yoddha by EIMOR Customs is simply fascinating. 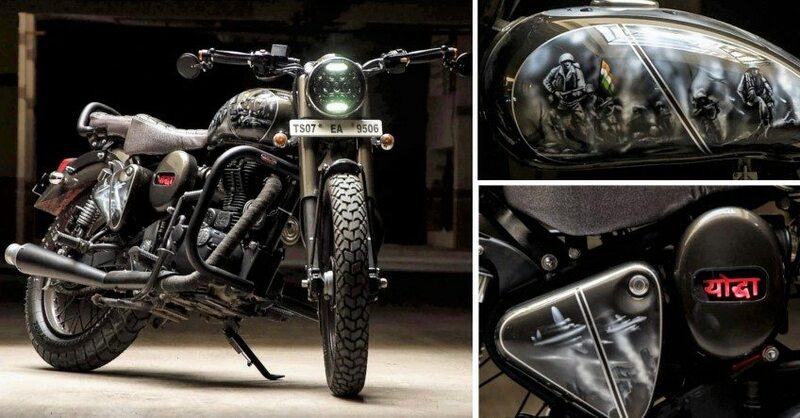 More like a piece of art and less of a motorcycle, Yoddha was built with a purpose. The owner’s son was a huge fan of men in uniform, bringing an idea of how EIMOR could work on this Classic to make it the most unique machine of its type. Army theme was selected at first but that would have felt too common for a 5 year old boy. 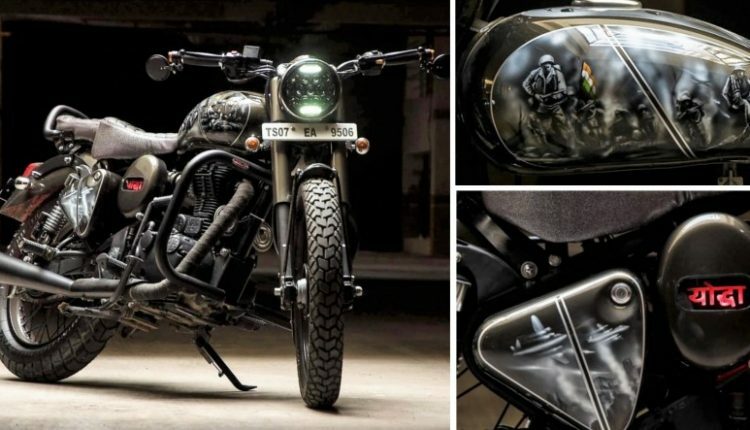 Instead of letting the shade speak for itself, EIMOR painted the motorcycle with pictures of soldiers carrying the Indian flag and moving for a combat. EIMOR gave a great paint job to the motorcycle, keeping front fascia intact and replacing the headlight with LED aftermarket unit. Dual purpose tyres and Black painted rims further complemented the job. They used a rich looking, custom seat cover with diamond quilting and extra padding for enhanced comfort and looks. 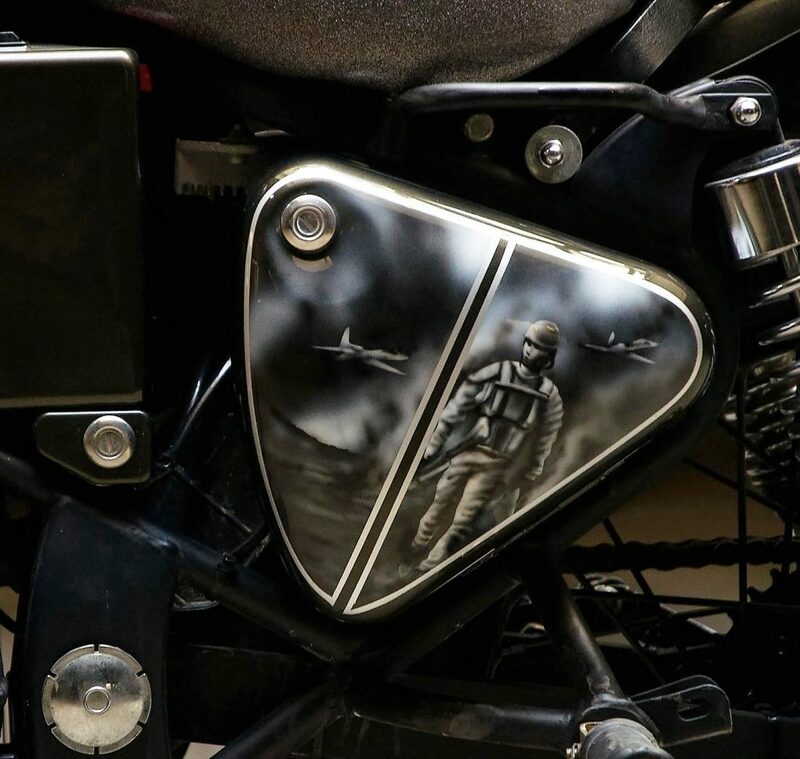 Rear fender is custom here while both side panels also have the soldier themed paint scheme with fighter jets and war scenes. A Black exhaust replaces the stock chrome unit while exit is wrapped with Black heat protection tape. Front and rear fenders also receive the war themed paint finish. 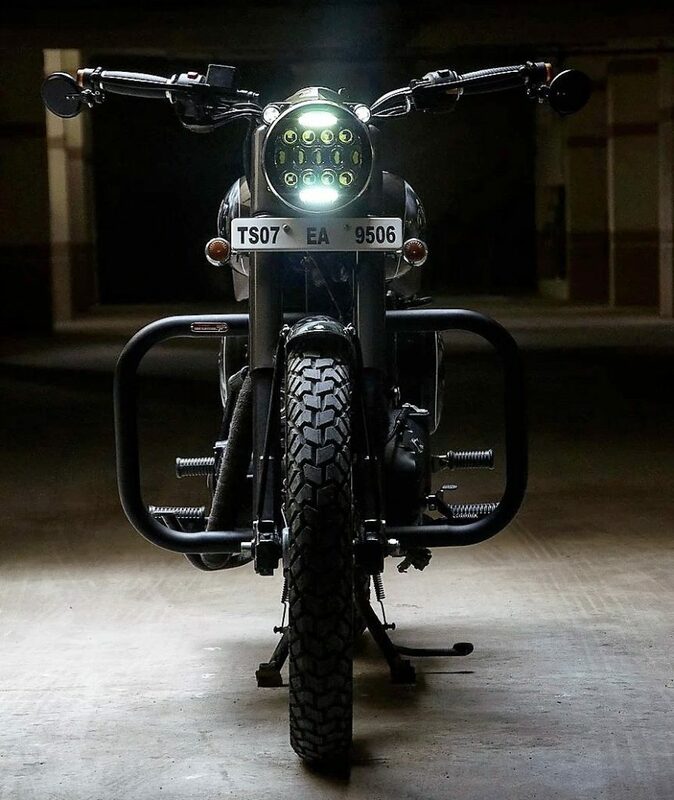 Apart from these, EIMOR used bar end rear view mirrors, custom brake lights, flat crash protectors and Yoddha moniker on the oval side panel. 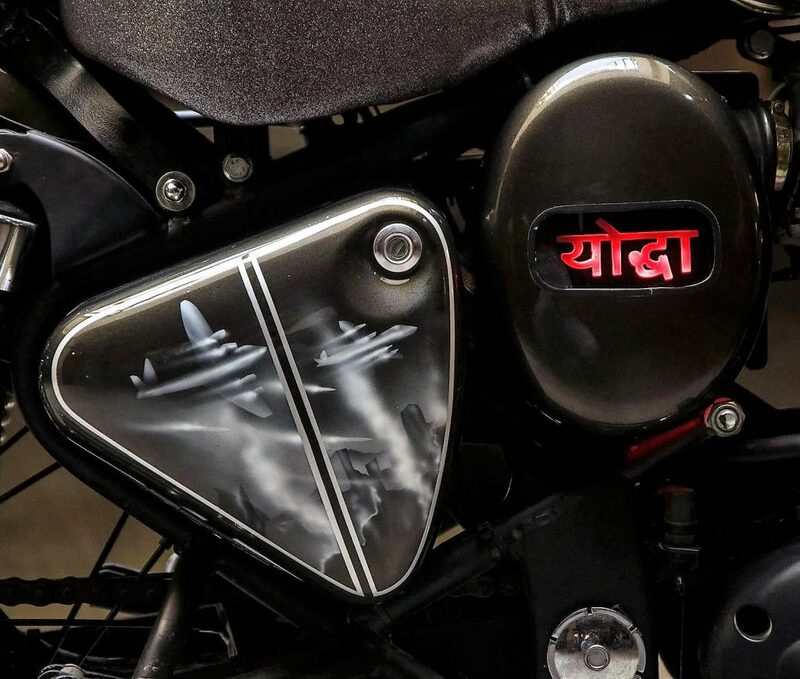 The engine of Yoddha is now finished in Matt Black. The cost of this modification is undisclosed while it can be had on both Classic 350 and Classic 500. Front disc brake stays the same as Classic series while rear now also comes with a disc brake on both the variants. 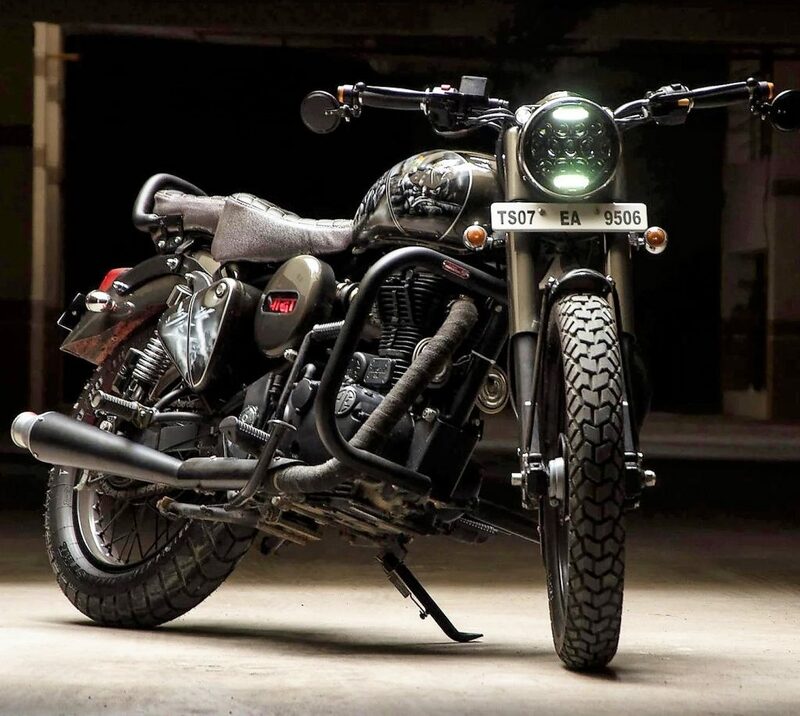 Classic 350 is powered by a 346cc, single cylinder engine producing 19.8 BHP and 28 Nm of torque. 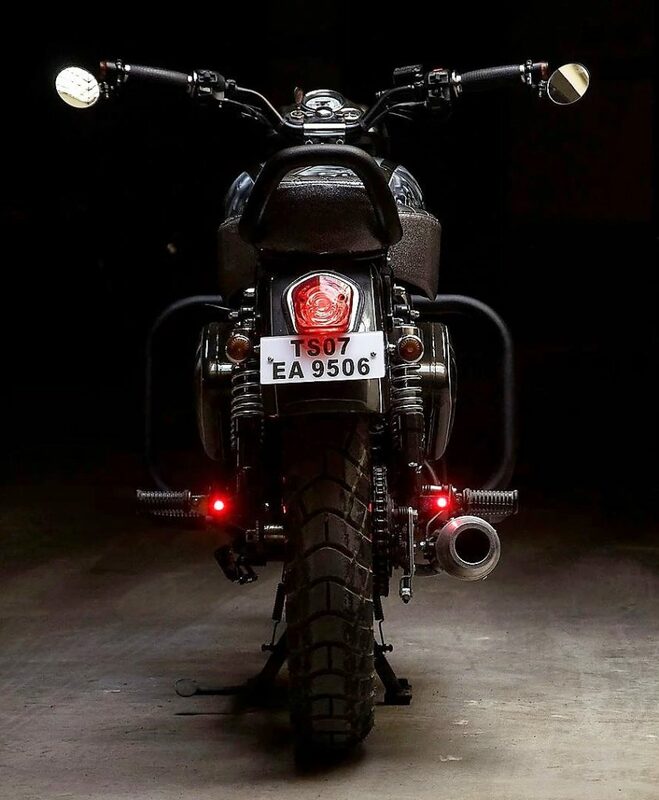 Classic 500, on the other hand, is powered by a 499cc engine producing 27.2 BHP and 41.4 Nm of massive torque.